Hey, I’ve released the four Dagmar Shaw near-future thrillers volumes as ebooks! New and improved, the first two with covers by Roberta Berto, and the last two with provisional covers that will be replaced by Berto covers as soon as she gets back from a trip. Which provisional cover you get depends on where you’re downloading from, since Amazon lets me put up a homemade cover and the others don’t. Anyway, if you end up with a provisional cover, you can wait till the new cover is released, erase the old copy from your device, and then download the new one. So no worries! 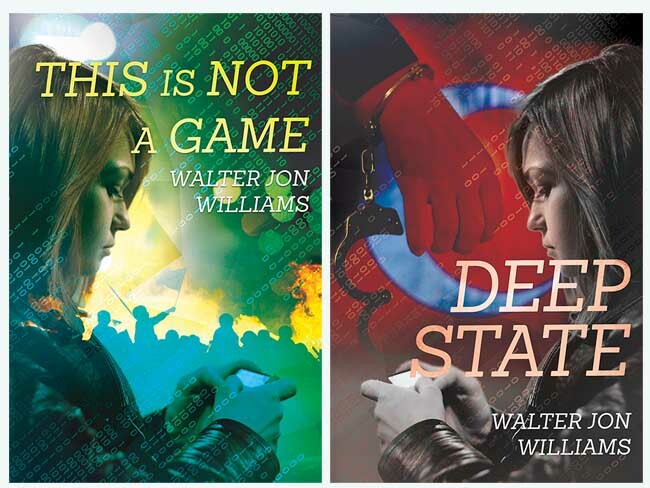 And if you do know that Deep State and The Fourth Wall were out there, you probably haven’t seen Diamonds from Tequila, which is a novella originally published in the Martin/Dozois anthology Rogues, and available now separately for the first time. Because it’s a novella rather than a novel, you can get it for a here $2.99. Amazon, Barnes & Noble, Kobo, Google, iBooks, Smashwords. I’ll go and pick up the novella right away, since I haven’t read it, and re-pick it up when the cover appears. There is no chance there will be more Dagmar books? Yay novella! More Dagmar can only be a good thing. I’m getting a “Not available in the US store” message from the iBooks store when I try to buy The Fourth Wall. Good to go on This Is Not a Game, Deep State, and Diamonds From Tequila, however. Thanks! Glen, there was a technical issue with the file which iBooks didn’t bother to tell me about. iBooks has some really stupid software. It’s supposedly fixed now, but might take 24 hours or so to percolate onto iBooks sites. Hey, waitasecond. Dagmar is supposed to be exceptionally recognizable for her untimely gray hair. WHO IS THAT IMPOSTOR/USUPER ON THE COVERS?!?!?!? Clearly Dagmar is in disguise. The artist tried giving her the signature gray hair, but the results were really, astoundingly unattractive. Ditto with blonde hair. It looks as if she had loaded Photoshop and pressed keys at random. Since I’d already bought the art and deadlines were upon us, we went with the current design.